Mail Trains in Georgetown? A Mystery. Something New in Postal Facilities. [Between 1919 and 1932] Photograph. Retrieved from the Library of Congress, <www.loc.gov/item/96501487/>. Postal service employee meeting train in Georgetown, D.C. to collect shipment of mail arriving from Rockville, Maryland. My understanding is that passenger service never existed on the GB apart from a few legendary troop trains and excursions. This makes sense, as there were really no platforms or stations along the route to properly serve passengers. Mail, well, that could be another story. A mail train to Georgetown could make sense, as it’s really just a type of freight. 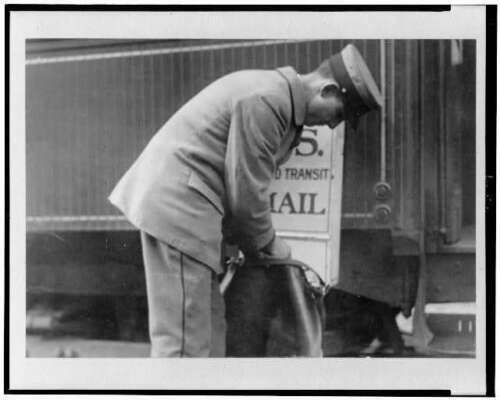 If anyone has any chops for identifying that passenger (mail?) car in the background of this image, or that sign (possibly advertising the new mail service) I would be most appreciative. I’m fascinated!